For the starting, lighting and ignition system battery of an automobile, see Automotive battery. An electric-vehicle battery (EVB) or traction battery is a battery used to power the propulsion of battery electric vehicles (BEVs). Vehicle batteries are usually a secondary (rechargeable) battery. Traction batteries are used in forklifts, electric golf carts, riding floor scrubbers, electric motorcycles, electric cars, trucks, vans, and other electric vehicles. Electric-vehicle batteries differ from starting, lighting, and ignition (SLI) batteries because they are designed to give power over sustained periods of time. Deep-cycle batteries are used instead of SLI batteries for these applications. Traction batteries must be designed with a high ampere-hour capacity. Batteries for electric vehicles are characterized by their relatively high power-to-weight ratio, specific energy and energy density; smaller, lighter batteries reduce the weight of the vehicle and improve its performance. Compared to liquid fuels, most current battery technologies have much lower specific energy, and this often impacts the maximal all-electric range of the vehicles. However, metal-air batteries have high specific energy because the cathode is provided by the surrounding oxygen in the air. Rechargeable batteries used in electric vehicles include lead–acid ("flooded", deep-cycle, and VRLA), NiCd, nickel–metal hydride, lithium-ion, Li-ion polymer, and, less commonly, zinc–air and molten-salt batteries. The most common battery type in modern electric cars are lithium-ion and Lithium polymer battery, because of their high energy density compared to their weight. The amount of electricity (i.e. electric charge) stored in batteries is measured in ampere hours or in coulombs, with the total energy often measured in watt hours. The battery makes up a substantial cost of BEVs, which unlike for fossil-fueled cars, profoundly manifests itself as a price of range. As of 2018, the few electric cars with over 500 km of range such as the Tesla Model S are firmly in the luxury segment. Since the late 1990s, advances in battery technology have been driven by demands for portable electronics, like laptop computers and mobile phones. The BEV marketplace has reaped the benefits of these advances both in performance, energy density. The batteries can be discharged and recharged each day. According to Mitsubishi president Osamu Masuko, the battery cost for the Mitsubishi i-MiEV was cut in half between 2009 and 2011. The cost of electric-vehicle batteries was reduced by more than 35% from 2008 to 2014. The predicted market for automobile traction batteries is over $37 billion in 2020. In terms of operating costs, the price of electricity to run an EV is a small fraction of the cost of fuel for equivalent internal combustion engines, reflecting higher energy efficiency. The cost of replacing the batteries dominates the operating costs. Cylindrical cell (18650) prior to assembly. 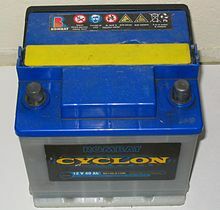 Flooded lead-acid batteries are the cheapest and in past most common traction batteries available. There are two main types of lead-acid batteries: automobile engine starter batteries, and deep cycle batteries. Automobile alternators are designed to provide starter batteries high charge rates for fast charges, while deep cycle batteries used for electric vehicles like forklifts or golf carts, and as the auxiliary house batteries in RV's, require different multi-stage charging. No lead acid battery should be discharged below 50% of its capacity, as it shortens the battery's life. Flooded batteries require inspection of electrolyte level and occasional replacement of water which gases away during the normal charging cycle. Traditionally, most electric vehicles have used lead-acid batteries due to their mature technology, high availability, and low cost (exception: some early EVs, such as the Detroit Electric, used a nickel–iron battery.) Like all batteries, these have an environmental impact through their construction, use, disposal or recycling. On the upside, vehicle battery recycling rates top 95% in the United States. Deep-cycle lead batteries are expensive and have a shorter life than the vehicle itself, typically needing replacement every 3 years. Lead-acid batteries in EV applications end up being a significant (25–50%) portion of the final vehicle mass. Like all batteries, they have significantly lower specific energy than petroleum fuels—in this case, 30–40 Wh/kg.While the difference isn't as extreme as it first appears due to the lighter drive-train in an EV, even the best batteries tend to lead to higher masses when applied to vehicles with a normal range. The efficiency (70–75%) and storage capacity of the current generation of common deep cycle lead acid batteries decreases with lower temperatures, and diverting power to run a heating coil reduces efficiency and range by up to 40%. Recent advances in battery efficiency, capacity, materials, safety, toxicity and durability are likely to allow these superior characteristics to be applied in car-sized EVs. Charging and operation of batteries typically results in the emission of hydrogen, oxygen and sulfur, which are naturally occurring and normally harmless if properly vented. Early Citicar owners discovered that, if not vented properly, unpleasant sulfur smells would leak into the cabin immediately after charging. Lead-acid batteries powered such early-modern EVs as the original versions of the EV1 and the RAV4 EV. Nickel-metal hydride batteries are now considered a relatively mature technology. While less efficient (60–70%) in charging and discharging than even lead-acid, they have a specific energy of 30–80 Wh/kg, far higher than lead-acid. When used properly, nickel-metal hydride batteries can have exceptionally long lives, as has been demonstrated in their use in hybrid cars and surviving NiMH RAV4 EVs that still operate well after 100,000 miles (160,000 km) and over a decade of service. Downsides include the poor efficiency, high self-discharge, very finicky charge cycles, and poor performance in cold weather. GM Ovonic produced the NiMH battery used in the second generation EV-1, and Cobasys makes a nearly identical battery (ten 1.2 V 85 Ah NiMH cells in series in contrast with eleven cells for Ovonic battery). This worked very well in the EV-1. Patent encumbrance has limited the use of these batteries in recent years. The sodium or "zebra" battery uses a molten chloroaluminate sodium (NaAlCl4) as the electrolyte. This chemistry is also occasionally referred to as "hot salt". A relatively mature technology, the Zebra battery has a specific energy of 120Wh/kg and reasonable series resistance. Since the battery must be heated for use, cold weather doesn't strongly affect its operation except for in increasing heating costs. They have been used in several EVs. Zebras can last for a few thousand charge cycles and are nontoxic. The downsides to the Zebra battery include poor power-to-weight (<300 W/kg) and the requirement of having to heat the electrolyte to about 270 °C (520 °F), which wastes some energy and presents difficulties in long-term storage of charge. Zebra batteries have been used in the Modec commercial vehicle since it entered production in 2006. Lithium-ion (and similar lithium polymer) batteries, widely known for their use in laptops and consumer electronics, predominate in use for the most recent group of EVs in development. The traditional lithium-ion chemistry involves a lithium cobalt oxide cathode and a graphite anode. This yields cells with an impressive 200+ Wh/kg specific energy and high specific power with 80 to 90% charge/discharge efficiency. The downside of traditional lithium-ion batteries include short cycle lives (hundreds to a few thousand charge cycles) and significant degradation with age. The cathode material is also somewhat toxic. Traditional lithium-ion batteries pose a fire safety risk if punctured or charged improperly. These early cells will not accept or supply charge when extremely cold, and so heaters can be necessary in some climates to warm them. The maturity of this technology is moderate. The Tesla Roadster (2008) uses groups of traditional lithium-ion "laptop battery" cells that can be replaced individually as needed. Recent EVs are utilizing new variations on lithium-ion chemistry that sacrifice specific energy and specific power to provide fire resistance, environmental friendliness, rapid charging (as quickly as a few minutes), and longer lifespans. These variants (phosphates, titanates, spinels, etc.) have been shown to have a much longer lifetime, with A123 types using lithium iron phosphate lasting at least 10+ years and 7000+ charge/discharge cycles, and LG Chem expecting their lithium-manganese spinel batteries to last up to 40 years. Much work is being done on lithium ion batteries in the lab. Lithium vanadium oxide has already made its way into the Subaru prototype G4e, doubling energy density. Silicon nanowires, silicon nanoparticles, and tin nanoparticles promise several times the energy density[clarification needed] in the anode, while composite and superlattice cathodes also promise significant density improvements. Prototypes of 50 watt-hour/kilogram lithium ion polymer battery. Newer Li-ion cells can provide up to 265 Wh/kg and last through thousands of charging cycles. In 2010, scientists at the Technical University of Denmark paid $10,000 for a certified EV battery with 25 kWh capacity (i.e. $400 per kilowatt hour), with no rebates or surcharges. Two out of 15 battery producers could supply the necessary technical documents about quality and fire safety. In 2010 it was estimated that at most 10 years would pass before the battery price would come down to 1/3. According to a 2010 study, by the National Research Council, the cost of a lithium-ion battery pack was about US$1,700/kWh of usable energy, and considering that a PHEV-10 requires about 2.0 kWh and a PHEV-40 about 8 kWh, the manufacturer cost of the battery pack for a PHEV-10 is around US$3,000 and it goes up to US$14,000 for a PHEV-40. The MIT Technology Review estimated the cost of automotive battery packs to be between US$225 to US$500 per kilowatt-hour by 2020. A 2013 study by the American Council for an Energy-Efficient Economy reported that battery costs came down from US$1,300 per kWh in 2007 to US$500 per kWh in 2012. The U.S. Department of Energy has set cost targets for its sponsored battery research of US$300 per kWh in 2015 and US$125 per kWh by 2022. Cost reductions through advances in battery technology and higher production volumes will allow plug-in electric vehicles to be more competitive with conventional internal combustion engine vehicles. In 2016, the world had a Li-Ion production capacity of 41.57 GWh. The actual costs for cells are subject to much debate and speculation as most EV manufacturers refuse to discuss this topic in detail. However, in October 2015, car maker GM revealed at their annual Global Business Conference that they expected a price of US$145 per-kilowatt-hour for Li-ion cells entering 2016, substantially lower than other analyst's cost estimates. GM also expects a cost of US$100 per kwh by the end of 2021. According to a study published in February 2016 by Bloomberg New Energy Finance (BNEF), battery prices fell 65% since 2010, and 35% just in 2015, reaching US$350 per kWh. The study concludes that battery costs are on a trajectory to make electric vehicles without government subsidies as affordable as internal combustion engine cars in most countries by 2022. BNEF projects that by 2040, long-range electric cars will cost less than US$22,000 expressed in 2016 dollars. BNEF expects electric car battery costs to be well below US$120 per kWh by 2030, and to fall further thereafter as new chemistries become available. In 2010, battery professor Poul Norby stated that he believed that lithium batteries will need to double their specific energy and bring down the price from $500 (2010) to $100 per kWh capacity in order to make an impact on petrol cars. Citigroup indicates $230/kWh. Toyota Prius 2012 plug-in's official page declare 21 kilometres (13 mi) of range and a battery capacity of 5.2 kWh with a ratio of 4 kilometres (2.5 mi)/kWh, while the Addax (2015 model) utility vehicle already reaches 110 kilometres (68.5 mi) or a ratio of 7.5 kilometers (4.6 mi)/kWh. Battery electric cars achieve about 5 miles (8.0 km)/kWh. The Chevrolet Volt is expected to achieve 50 MPGe when running on the auxiliary power unit (a small onboard generator) – at 33% thermodynamic efficiency that would mean 12 kWh for 50 miles (80 km), or about 240 watt-hours per mile. For prices of 1 kWh of charge with various different battery technologies, see the "Energy/Consumer Price" column in the "Table of rechargeable battery technologies" section in the rechargeable battery article. United States Secretary of Energy Steven Chu predicted costs for a 40-mile range battery will drop from a price in 2008 of $12K to $3,600 in 2015 and further to $1,500 by 2020. Li-ion, Li-poly, Aluminium-air batteries and zinc-air batteries have demonstrated specific energies high enough to deliver range and recharge times comparable to conventional fossil fuelled vehicles. Different costs are important. One issue is purchase price, the other issue is total cost of ownership. As of 2015, electric cars are more expensive to initially purchase, but cheaper to run, and in at least some cases, total cost of ownership may be lower. According to Kammen et al., 2008, new PEVs would become cost efficient to consumers if battery prices would decrease from $1300/kWh to about $500/kWh (so that the battery may pay for itself). In 2010, the Nissan Leaf battery pack was reportedly produced at a cost of $18,000. Nissan's initial production costs at the launch of the Leaf were therefore about $750 per kilowatt hour (for the 24 kWh battery). In 2012, McKinsey Quarterly linked battery prices to gasoline prices on a basis of 5-year total cost of ownership for a car, estimating that $3.50/gallon equate to $250/kWh. In 2017 McKinsey estimated that electric cars are competitive at a battery pack cost of $100/kWh (around 2030), and expects pack costs to be $190/kWh by 2020. In October 2015, car maker GM revealed at their annual Global Business Conference that they expected a price of $145 per kilowatt hour for Li-ion cells entering 2016. Driving range parity means that the electric vehicle has the same range than an average all-combustion vehicle (500 kilometres or 310 miles), with 1+ kWh/kg batteries. Higher range means that the electric vehicles would run more kilometers without recharge. Japanese and European Union officials are in talks to jointly develop advanced rechargeable batteries for electric cars to help nations reduce greenhouse-gas emissions. Developing a battery that can power an electric vehicle 500 kilometres (310 mi) on a single charging is feasible, said Japanese battery maker GS Yuasa Corp. Sharp Corp and GS Yuasa are among Japanese solar-power cell and battery makers that may benefit from cooperation. The lithium-ion battery in the AC Propulsion tzero provides 400 to 500 km (200 to 300 mi) of range per charge (single charge range). The list price of this vehicle when it was released in 2003 was $220,000. Driving in a Daihatsu Mira equipped with 74 kWh lithium ion batteries, the Japan EV Club has achieved a world record for an electric car: 1,003 kilometres (623 mi) without recharging. Tesla Model S with 85 kWh battery has a range of 510 km (320 miles). Tesla Model S has been built since 2012. It is priced around US$100,000. The supercar Rimac Concept One with 82 kWh battery has a range of 500 km. The car is built since 2013. The pure electric car BYD e6 with 60 kWh battery has a range of 300 km. Electric truck e-Force One. Battery pack between the axles. Battery pack designs for Electric Vehicles (EVs) are complex and vary widely by manufacturer and specific application. However, they all incorporate a combination of several simple mechanical and electrical component systems which perform the basic required functions of the pack. The actual battery cells can have different chemistry, physical shapes, and sizes as preferred by various pack manufacturers. Battery pack will always incorporate many discrete cells connected in series and parallel to achieve the total voltage and current requirements of the pack. Battery packs for all electric drive EVs can contain several hundred individual cells. To assist in manufacturing and assembly, the large stack of cells is typically grouped into smaller stacks called modules. Several of these modules will be placed into a single pack. Within each module the cells are welded together to complete the electrical path for current flow. Modules can also incorporate cooling mechanisms, temperature monitors, and other devices. In most cases, modules also allow for monitoring the voltage produced by each battery cell in the stack by the Battery Management System (BMS). The battery cell stack has a main fuse which limits the current of the pack under a short circuit condition. A "service plug" or "service disconnect" can be removed to split the battery stack into two electrically isolated halves. With the service plug removed, the exposed main terminals of the battery present no high potential electrical danger to service technicians. The battery pack also contains relays, or contactors, which control the distribution of the battery pack’s electrical power to the output terminals. In most cases there will be a minimum of two main relays which connect the battery cell stack to the main positive and negative output terminals of the pack, those supplying high current to the electrical drive motor. Some pack designs will include alternate current paths for pre-charging the drive system through a pre-charge resistor or for powering an auxiliary buss which will also have their own associated control relays. For obvious safety reasons these relays are all normally open. The battery pack also contains a variety of temperature, voltage, and current sensors. Collection of data from the pack sensors and activation of the pack relays are accomplished by the pack ’s Battery Monitoring Unit (BMU) or Battery Management System (BMS). The BMS is also responsible for communications with the world outside the battery pack. Batteries in BEVs must be periodically recharged. BEVs most commonly charge from the power grid (at home or using a street or shop recharging point), which is in turn generated from a variety of domestic resources, such as coal, hydroelectricity, nuclear and others. Home or grid power, such as photovoltaic solar cell panels, microhydro or wind may also be used and are promoted because of concerns regarding global warming. With suitable power supplies, good battery lifespan is usually achieved at rates not exceeding "0.5C" or so, taking two to three hours for a full charge, but faster charging can be done. Charging time is often limited by the capacity of the grid connection. A normal household outlet delivers 1.5 kilowatts (in the US, Canada, Japan, and other countries with 110 volt supply) and 3 kilowatts (in countries with 230 V supply). In 1995, some charging stations charged BEVs in one hour. In November 1997, Ford purchased a fast-charge system produced by AeroVironment called "PosiCharge" for testing its fleets of Ranger EVs, which charged their lead-acid batteries in between six and fifteen minutes. In February 1998, General Motors announced a version of its "Magne Charge" system which could recharge NiMH batteries in about ten minutes, providing a range of sixty to one hundred miles. In 2005, handheld device battery designs by Toshiba were claimed to be able to accept an 80% charge in as little as 60 seconds. Scaling this characteristic up to the same 7 kilowatt-hour EV pack would result in the need for a peak of 340 kilowatts of power from some source for those 60 seconds. It is not clear that such batteries will work directly in BEVs as heat build-up may make them unsafe. Electric cars like Tesla Model S, Renault Zoe, BMW i3, etc. can recharge their batteries at quick charging stations within 30 minutes to 80 percent. Researchers from Singapore have 2014 developed a battery that can be recharged after 2 minutes to 70 percent. The batteries rely on lithium-ion technology. However, the anode and the negative pole in the battery is no longer made of graphite, but a titanium dioxide gel. The gel accelerates the chemical reaction significantly, thus ensuring a faster charging. In particular, these batteries are to be used in electric cars. Already in 2012 researchers at the Ludwig-Maximilian-University in Munich have discovered the basic principle. Scientists at Stanford University in California have developed a battery that can be charged within one minute. The anode is made of aluminum and the cathode made of graphite (see Aluminium-ion battery). The electric car Volar-e of the company Applus + IDIADA, based on the Rimac Concept One, contains lithium iron phosphate batteries that can be recharged in 15 minutes. According to the manufacturer BYD the lithium iron phosphate battery of the electric car e6 is charged at a fast charging station within 15 minutes to 80%, after 40 minutes at 100%. The charging power can be connected to the car in two ways. The first is a direct electrical connection known as conductive coupling. This might be as simple as a mains lead into a weatherproof socket through special high capacity cables with connectors to protect the user from high voltages. The modern standard for plug-in vehicle charging is the SAE 1772 conductive connector (IEC 62196 Type 1) in the US. The ACEA has chosen the VDE-AR-E 2623-2-2 (IEC 62196 Type 2) for deployment in Europe, which, without a latch, means unnecessary extra power requirements for the locking mechanism. The second approach is known as inductive charging. A special 'paddle' is inserted into a slot on the car. The paddle is one winding of a transformer, while the other is built into the car. When the paddle is inserted it completes a magnetic circuit which provides power to the battery pack. In one inductive charging system, one winding is attached to the underside of the car, and the other stays on the floor of the garage. The advantage of the inductive approach is that there is no possibility of electrocution as there are no exposed conductors, although interlocks, special connectors and ground fault detectors can make conductive coupling nearly as safe. Inductive charging can also reduce vehicle weight, by moving more charging componentry offboard. An inductive charging proponent from Toyota contended in 1998, that overall cost differences were minimal, while a conductive charging proponent from Ford contended that conductive charging was more cost efficient. In France, Électricité de France (EDF) and Toyota are installing recharging points for PHEVs on roads, streets and parking lots. EDF is also partnering with Elektromotive, Ltd. to install 250 new charging points over six months from October 2007 in London and elsewhere in the UK. Recharging points also can be installed for specific uses, as in taxi stands. Lead-acid batteries are the most available and inexpensive. Such conversions generally have a range of 30 to 80 km (20 to 50 mi). Production EVs with lead-acid batteries are capable of up to 130 km (80 mi) per charge. NiMH batteries have higher specific energy than lead-acid; prototype EVs deliver up to 200 km (120 mi) of range. New lithium-ion battery-equipped EVs provide 320–480 km (200–300 mi) of range per charge. Lithium is also less expensive than nickel. Nickel-zinc battery are cheaper and lighter than Nickel-cadmium batteries. They are also cheaper (but not as light) than Lithium-Ion batteries. Finding the economic balance of range versus performance, battery capacity versus weight, and battery type versus cost challenges every EV manufacturer. With an AC system or Advanced DC systems regenerative braking can extend range by up to 50% under extreme traffic conditions without complete stopping. Otherwise, the range is extended by about 10 to 15% in city driving, and only negligibly in highway driving, depending upon terrain. BEVs (including buses and trucks) can also use genset trailers and pusher trailers in order to extend their range when desired without the additional weight during normal short range use. Discharged baset trailers can be replaced by recharged ones in a route point. If rented then maintenance costs can be deferred to the agency. Such BEVs can become Hybrid vehicles depending on the trailer and car types of energy and powertrain. The bestseller Nissan Leaf model year 2016 with 30 kWh battery has a range of 172 km. Axillary battery capacity carried in trailers can increase the overall vehicle range, but also increases the loss of power arising from aerodynamic drag, increases weight transfer effects and reduces traction capacity. The internal resistance of some batteries may be significantly increased at low temperature which can cause noticeable reduction in the range of the vehicle and on the lifetime of the battery. An alternative to recharging is to exchange drained or nearly drained batteries (or battery range extender modules) with fully charged batteries. This is called battery swapping and is done in exchange stations. On the other hand, MIRA has announced a retrofit hybrid conversion kit that provides removable battery packs that plug into a wall outlet for charging. Also XP Vehicles uses extension-cord-free charging hot-swap battery (removable power pack to recharge at home without extension cord). Zinc-bromine flow batteries can be re-filled using a liquid, instead of recharged by connectors, saving time. Three companies are working on battery lease plans. Greenstop has completed trials of their ENVI Grid Network which allows consumers to easily monitor and recharge electric vehicle batteries. Think Car USA plans to lease the batteries for its City electric car to go on sale next year. Better Place is creating a system for consumers to "subscribe" to a service that offers recharging stations and battery exchange. Electric utilities are considering plans which would include providing electric vehicles to users (at a low price) and get their profits from selling the energy. Pacific Gas and Electric Company (PG&E) has suggested that utilities could purchase used batteries for backup and load levelling purposes. They state that while these used batteries may be no longer usable in vehicles, their residual capacity still has significant value. Individual batteries are usually arranged into large battery packs of various voltage and ampere-hour capacity products to give the required energy capacity. Battery service life should be considered when calculating the extended cost of ownership, as all batteries eventually wear out and must be replaced. The rate at which they expire depends on a number of factors. The depth of discharge (DOD) is the recommended proportion of the total available energy storage for which that battery will achieve its rated cycles. Deep cycle lead-acid batteries generally should not be discharged to below 20% of total capacity. More modern formulations can survive deeper cycles. "The five-vehicle test is demonstrating the long-term durability of Nickel Metal Hydride batteries and electric drive trains. Only slight performance degradation has been observed to-date on four out of five vehicles.... EVTC test data provide strong evidence that all five vehicles will exceed the 100,000-mile (160,000 km) mark. SCE’s positive experience points to the very strong likelihood of a 130,000 to 150,000-mile (240,000 km) Nickel Metal Hydride battery and drive-train operational life. EVs can therefore match or exceed the lifecycle miles of comparable internal combustion engine vehicles. "In June 2003 the 320 RAV4 EVs of the SCE fleet were used primarily by meter readers, service managers, field representatives, service planners and mail handlers, and for security patrols and carpools. In five years of operation, the RAV4 EV fleet had logged more than 6.9 million miles, eliminating about 830 tons of air pollutants, and preventing more than 3,700 tons of tailpipe carbon dioxide emissions. Given the successful operation of its EVs to-date, SCE plans to continue using them well after they all log 100,000-miles." Lithium ion batteries are perishable to some degree; they lose some of their maximum storage capacity per year even if they are not used. Nickel metal hydride batteries lose much less capacity and are cheaper for the storage capacity they give, but have a lower total capacity initially for the same weight. Jay Leno's 1909 Baker Electric (see Baker Motor Vehicle) still operates on its original Edison cells. Battery replacement costs of BEVs may be partially or fully offset by the lack of regular maintenance such as oil and filter changes required for ICEVs, and by the greater reliability of BEVs due to their fewer moving parts. They also do away with many other parts that normally require servicing and maintenance in a regular car, such as on the gearbox, cooling system, and engine tuning. And by the time batteries do finally need definitive replacement, they can be replaced with later generation ones which may offer better performance characteristics. 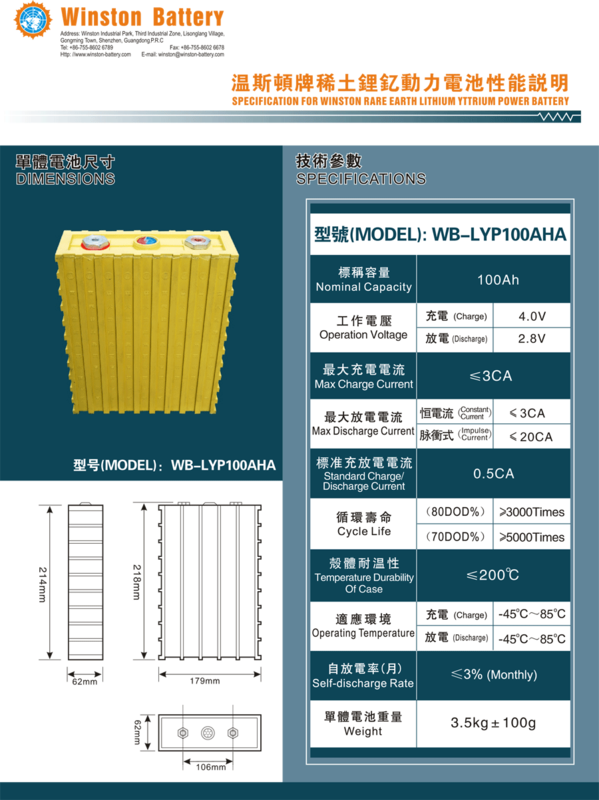 Lithium iron phosphate batteries reach, according to the manufacturer, more than 5000 cycles at respective depth of discharge of 70%.BYD, the world's largest manufacturer of lithium iron phosphate batteries, has developed a wide range of cells for deep cycle applications through precision manufacturing. Such batteries are in use in stationary storage systems. After 7500 cycles, with discharge of 85%, they still have a spare capacity of at least 80% at a rate of 1 C; which corresponds with a full cycle per day to a lifetime of min. 20.5 years. The lithium iron phosphate battery Sony Fortelion has after 10,000 cycles at 100% discharge level still a residual capacity of 71%. This accumulator is since 2009 on the market. Used in solar batteries Lithium-ion batteries have partly a very high cycle resistance of more than 10,000 charge and discharge cycles and a long service life of up to 20 years. Plug-in America has among drivers of the Tesla Roadster (2008), a survey carried out with respect to the service life of the installed battery. It was found that after 100,000 miles = 160,000 km, the battery still had a remaining capacity of 80 to 85 percent. This was regardless of in which climate zone the car is moved. The Tesla Roadster was built and sold between 2008 and 2012. For its 85-kWh batteries in the Tesla Model S Tesla are 8-year warranty with unlimited mileage. Varta Storage abandons his family engion[clarification needed] family and engion home a guarantee of 14,000 full cycles and a service life of 10 years. As of December 2016[update], the world's all-time best-selling electric car is the Nissan Leaf, with more than 250,000 units sold since its inception in 2010. Nissan stated in 2015 that until then only 0.01 percent of batteries had to be replaced because of failures or problems and then only because of externally inflicted damage. There are a few vehicles that have already covered more than 200,000 km; none of these had any problems with the battery. At the end of their useful life, batteries can be recycled. In 2017 however, only just 5% of lithium-ion batteries were actually recycled. Protection of persons against electrical hazards. Firefighters and rescue personnel receive special training to deal with the higher voltages and chemicals encountered in electric and hybrid electric vehicle accidents. While BEV accidents may present unusual problems, such as fires and fumes resulting from rapid battery discharge, many experts agree that BEV batteries are safe in commercially available vehicles and in rear-end collisions, are safer than gasoline-propelled cars with a rear gasoline tanks. Performance testing simulates the drive cycles for the drive trains of Battery Electric Vehicles (BEV), Hybrid Electric Vehicles (HEV) and Plug in Hybrid Electric Vehicles (PHEV) as per the required specifications of car manufacturers (OEMs). During these drive cycles, controlled cooling of the battery can be performed, simulating the thermal conditions in the car. In addition, climatic chambers assure constant environmental conditions during the characterization and allow the simulation to be performed for the full automotive temperature range covering climatic conditions. Patents may be used to suppress development or deployment of this technology. For instance, patents relevant to the use of Nickel metal hydride cells in cars were held by an offshoot of Chevron Corporation, a petroleum company, who maintained veto power over any sale or licensing of NiMH technology. Argonne National Laboratory has received an award for EnerDel/Argonne High-Power Lithium-Ion Battery for Hybrid Electric Vehicles – a highly reliable and extremely safe device that is lighter in weight, more compact, more powerful and longer lasting than the nickel-metal hydride (Ni-MH) batteries that are found in today’s hybrid electric vehicles. Lawrence Berkeley National Laboratory: Nanostructured Polymer Electrolyte for Rechargeable Lithium Batteries – a polymer electrolyte that enables the development of rechargeable lithium metal batteries with a specific energy that is high enough "to enable electric battery-driven transportation technology". Battery-operated vehicles (like the Nissan Leaf) are projected to have annual sales in 2020 of 100,000 units in the U.S. and 1.3 million worldwide — 1.8 percent of the 71 million cars expected to be sold in 2020. Another 3.9 million plug-ins and hybrids will be sold worldwide, bringing the total electric and hybrid market to about 7 percent of all cars sold in 2020. Bolloré a French automotive parts group developed a concept car the "Bluecar" using Lithium metal polymer batteries developed by a subsidiary Batscap. It had a range of 250 km and top speed of 125 km/h. 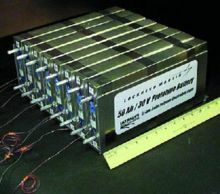 Electric double-layer capacitors (or "ultracapacitors") are used in some electric vehicles, such as AFS Trinity's concept prototype, to store rapidly available energy with their high specific power, in order to keep batteries within safe resistive heating limits and extend battery life. Since commercially available ultracapacitors have a low specific energy no production electric cars use ultracapacitors exclusively. But using an Electric car with both Battery and ultracapacitor can reduce the limitations of both. As U.S. President Barack Obama announced 48 new advanced battery and electric drive projects that would receive $2.4 billion in funding under the American Recovery and Reinvestment Act. These projects will accelerate the development of U.S. manufacturing capacity for batteries and electric drive components as well as the deployment of electric drive vehicles, helping to establish American leadership in creating the next generation of advanced vehicles. The announcement marks the single largest investment in advanced battery technology for hybrid and electric-drive vehicles ever made. Industry officials expect that this $2.4 billion investment, coupled with another $2.4 billion in cost share from the award winners, will result directly in the creation tens of thousands of manufacturing jobs in the U.S. battery and auto industries. The new awards cover $1.5 billion in grants to United States-based manufacturers to produce batteries and their components and to expand battery recycling capacity. U.S. Vice President Joe Biden announced in Detroit over $1 billion in grants to companies and universities based in Michigan. Reflecting the state's leadership in clean energy manufacturing, Michigan companies and institutions are receiving the largest share of grant funding of any state. Two companies, A123 Systems and Johnson Controls, will receive a total of approximately $550 million to establish a manufacturing base in the state for advanced batteries, and two others, Compact Power and Dow Kokam, will receive a total of over $300 million for manufacturing battery cells and materials. Large automakers based in Michigan, including GM, Chrysler, and Ford, will receive a total of more than $400 million to manufacture batteries and electric drive components. And three educational institutions in Michigan — the University of Michigan, Wayne State University in Detroit, and Michigan Technological University in Houghton, in the Upper Peninsula — will receive a total of more than $10 million for education and workforce training programs to train researchers, technicians, and service providers, and to conduct consumer research to accelerate the transition towards advanced vehicles and batteries. Energy Secretary Steven Chu visited Celgard, in Charlotte, North Carolina, to announce a $49 million grant for the company to expand its separator production capacity to serve the expected increased demand for lithium-ion batteries from manufacturing facilities in the United States. Celgard will be expanding its manufacturing capacity in Charlotte, North Carolina, and nearby Concord, North Carolina, and the company expects the new separator production to come online in 2010. Celgard expects that approximately hundreds of jobs could be created, with the first of those jobs beginning as early as fall 2009. EPA Administrator Lisa Jackson was in St. Petersburg, Florida, to announce a $95.5 million grant for Saft America, Inc. to construct a new plant in Jacksonville on the site of the former Cecil Field military base, to manufacture lithium-ion cells, modules and battery packs for military, industrial, and agricultural vehicles. Deputy Secretary of the Department of Transportation John Porcari visited East Penn Manufacturing Co, in Lyon Station, Pennsylvania, to award the company a $32.5 million grant to increase production capacity for their valve regulated lead-acid batteries and the UltraBattery, a lead-acid battery combined with a carbon supercapacitor, for micro and mild hybrid applications. ^ "Mitsubishi i-MiEV lineup expands for 2012 with cheaper "M" and extended-range "G"". green.autoblog.com. Retrieved 2014-02-01. ^ "Vehicles - Department of Energy: Energy.gov". energy.gov. Retrieved 2014-05-03. ^ "Car Traction Batteries - the New Gold Rush 2010-2020: IDTechEx". idtechex.com. 2009-08-24. Retrieved 2014-02-01. ^ "Electric Vehicles in the United States: A New Model with Forecasts to 2030" (PDF). Archived from the original (PDF) on 2011-09-15. The 2012 per-mile cost under this scenario will be 10¢ per mile. If the batteries are able to achieve 3,000 100-mile charge cycles and the vehicle is driven 15,000 miles per year, the 2012 per-mile cost is approximately 6.7¢ per mile. The likely lifetime of electric vehicle batteries is likely to fall somewhere within this range. The cost of electricity for electric cars is on the order of 2¢ per mile, though electricity prices vary by region across the U.S.
^ "200 Wh/kg Barrier Falls. | Battery & EV Technology | Find Articles at BNET". Findarticles.com. 2009-06-02. Retrieved 2009-09-19. ^ "Lithium-Ion Batteries Hazard and Use Assessment" (PDF). Retrieved 2013-09-07. ^ "A123 Inks Deal to Develop Battery Cells for GM Electric Car". 2007-08-10. Retrieved 2016-12-10. 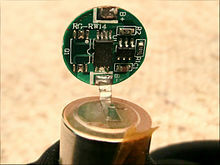 ^ "Li-Ion Rechargeable Batteries Made Safer". Nikkei Electronics Asia. February 2008. Archived from the original on 2011-09-12. ^ "Nanowire battery can hold 10 times the charge of existing lithium-ion battery". 2008-01-09. Retrieved 2016-12-10. ^ Cui, Yi. "Inorganic Nanowires as Advanced Energy Conversion and Storage Materials" (PDF). US: Stanford University. Retrieved 2019-03-31. ^ Jaques, Robert (2008-04-14). "Nanotech promises lithium ion battery boost". vnunet.com. Archived from the original on 2009-04-08. Retrieved 2013-10-03. ^ "Using nanotechnology to improve Li-ion battery performance". Retrieved 2016-12-10. ^ Zhang, Wei-Ming; Hu, Jin-Song; Guo, Yu-Guo; Zheng, Shu-Fa; Zhong, Liang-Shu; Song, Wei-Guo; Wan, Li-Jun (2008). "Tin-Nanoparticles Encapsulated in Elastic Hollow Carbon Spheres for High-Performance Anode Material in Lithium-Ion Batteries - Zhang - 2008 - Advanced Materials - Wiley Online Library". Advanced Materials. 20 (6): 1160–1165. doi:10.1002/adma.200701364. ^ "Argonne's lithium-ion battery technology to be commercialized by Japan's Toda Kogyo". Retrieved 2016-12-10. ^ Johnson, Christopher S. (2007). "Journal of Power Sources : Development and utility of manganese oxides as cathodes in lithium batteries". Journal of Power Sources. 165 (2): 559–565. doi:10.1016/j.jpowsour.2006.10.040. Archived from the original on 2009-02-12. Retrieved 2010-02-12. ^ "Hybrid Develops New "Superlattice Structure" Lithium Battery Capable of Increasing Drive Ranges in Excess of 200 Miles". Hybrid Technologies. US. 2008-02-24. Archived from the original on 2008-03-02. ^ "Regera". Koenigsegg. Retrieved 2016-12-28. ^ a b Bredsdorff, Magnus (2010-06-22). "Et batteri til en elbil koster 60.000 kroner" [Electrical Vehicle battery costs $10,000]. Ingeniøren (in Danish). Retrieved 2017-01-30. ^ Bredsdorff, Magnus (2010-06-22). "EV batteries still prototypes". Ingeniøren (in Danish). Denmark. Retrieved 2010-06-22. ^ National Research Council (2010). Transitions to Alternative Transportation Technologies--Plug-in Hybrid Electric Vehicles. The National Academies Press. doi:10.17226/12826. ISBN 978-0-309-14850-4. Archived from the original on 2011-06-07. Retrieved 2010-03-03. ^ Jad Mouawad and Kate Galbraith (2009-12-14). "Study Says Big Impact of the Plug-In Hybrid Will Be Decades Away". New York Times. Retrieved 2010-03-04. ^ Tommy McCall (2011-06-25). "THE PRICE OF BATTERIES" (PDF). MIT Technology Review. Retrieved 2017-05-05. ^ Siddiq Khan and Martin Kushler (June 2013). "Plug-in Electric Vehicles: Challenges and Opportunities" (PDF). American Council for an Energy-Efficient Economy. Retrieved 2013-07-09. ACEEE Report Number T133. ^ Gibbs, Nick (2017-01-02). "Automakers hunt for battery cell capacity to deliver on bullish EV targets". Automotive News. Archived from the original on 2017-01-09. Retrieved 2017-01-09. ^ a b c Cobb, Jeff (2015-10-02). "Chevy Bolt Production Confirmed For 2016". Hybrid cars. Retrieved 2015-12-14. ^ Randall, Tom (2016-02-25). "Here's How Electric Cars Will Cause the Next Oil Crisis". Bloomberg News. Retrieved 2016-02-26. See embedded video. ^ Bloomberg New Energy Finance (2016-02-25). "Here's How Electric Cars Will Cause the Next Oil Crisis" (Press release). London and New York: PR Newswire. Retrieved 2016-02-26. ^ Dalløkken, Per Erlien (2016-12-23). "Her produseres elbilen og bensinbilen på samme linje" [Electric car and petrol truck produced on the same line]. Teknisk Ukeblad (in Norwegian). Norway. Retrieved 2018-08-16. ^ "Tesla to Miss 2020 Delivery Target by 40%, Analyst Forecasts". greentechmedia.com. 2014-12-17. Retrieved 2015-01-28. Tesla’s current batteries cost $200-$300 per kilowatt hour. ^ "Battery technology charges ahead | McKinsey & Company". mckinsey.com. Retrieved 2014-02-01. ^ "Lithium-ion battery costs will still be about $400/kWh by 2020". green.autoblog.com. Retrieved 2014-02-01. ^ a b c "McKinsey: Lithium Ion Battery Prices to Reach $200 Per kWh by 2020 | PluginCars.com". plugincars.com. Retrieved 2014-02-01. ^ a b "Tesla Debacle Highlights Need For New EV Battery Technology - Forbes". forbes.com. Retrieved 2014-02-01. ^ "WSJ: Nissan Leaf profitable by year three; battery cost closer to $18,000". green.autoblog.com. Retrieved 2014-02-01. ^ Anderman, Menahem (2003). "Brief Assessment of Improvements in EV BatteryTechnology since the BTAP June 2000 Report" (PDF). California Air Resources Board. Retrieved 2018-08-16. ^ a b "GM, Chevron and CARB killed the NiMH EV once, will do so again". ev1.org. Retrieved 2014-02-01. ^ a b c "Elektroautos von BYD: FENECON startet Verkauf des e6". SonneWind&Wärme (in German). 2016-02-11. Retrieved 2016-12-14. ^ "10 years guaranty for battery". byd-auto.net. Archived from the original on 2016-02-06. ^ a b "HowStuffWorks "Lithium-ion Battery Cost and Longevity"". auto.howstuffworks.com. 2008-07-09. Retrieved 2014-02-01. ^ a b Kohler, U.; Kumpers, J.; Ullrich, M. (2002). "High performance nickel-metal hydride and lithium-ion batteries". Journal of Power Sources. 105 (2): 139–144. doi:10.1016/s0378-7753(01)00932-6. ^ a b c Uehara, I.; Sakai, T.; Ishikawa, H. (1997). "The state of research and development for applications of metal hydrides in Japan". Journal of Alloys and Compounds. 253: 635–641. doi:10.1016/s0925-8388(96)03090-3. ^ a b Taniguchi, Akihiro; Fujioka, Noriyuki; Ikoma, Munehisa; Ohta, Akira (2001). "Development of nickel/metal-hydride batteries for EVs and HEVs". Journal of Power Sources. 100 (1–2): 117–124. doi:10.1016/s0378-7753(01)00889-8. ^ a b Sakai, Tetsuo; Uehara, Ituki; Ishikawa, Hiroshi (1999). "R&D on metal hydride materials and Ni–MH batteries in Japan". Journal of Alloys and Compounds. 293: 762–769. doi:10.1016/s0925-8388(99)00459-4. ^ Ruetschi, Paul; Meli, Felix; Desilvestro, Johann (1995). "Nickel-metal hydride batteries. The preferred batteries of the future?". Journal of Power Sources. 57 (1–2): 85–91. doi:10.1016/0378-7753(95)02248-1. ^ Simonsen, Torben (2010-09-23). "Density up, price down". Electronic Business (in Danish). Archived from the original on 2010-09-25. Retrieved 2010-09-24. ^ "Addax, c'est belge, utilitaire, électrique… et cocasse". L'Echo (in French). 2018-04-06. Retrieved 2018-04-11. ^ "Electric Car Battery Prices on Track to Drop 70% by 2015, Says Energy Secretary : TreeHugger". treehugger.com. Retrieved 2014-02-01. ^ Klayman, Ben (2012-01-11). "Electric vehicle battery costs coming down: Chu". Reuters. Retrieved 2016-12-04. ^ a b "Nissan Leaf profitable by year three; battery cost closer to $18,000". AutoblogGreen. 2010-05-15. Retrieved 2010-05-15. ^ Lambert, Fred (2017-01-30). "Electric vehicle battery cost dropped 80% in 6 years down to $227/kWh – Tesla claims to be below $190/kWh". Electrek. Retrieved 2017-01-30. ^ "Google Answers: Driving range for cars". Retrieved 2014-02-01. ^ Okada, Shigeru Sato & Yuji (2009-03-08). "EU, Japan may study advanced solar cells | Business Standard". Business Standard India. business-standard.com. Retrieved 2014-02-01. ^ a b c "40(min) / 15(min 80%)". byd-auto.net. Archived from the original on 2016-02-06. ^ a b "Leader of Battery Safety & Battery Regulation Programs - PBRA" (PDF). Retrieved 2016-12-10. ^ Anderson, C.D. and Anderson, J. (2005) "New Charging Systems" Electric and Hybrid Cars: a History (North Carolina: McFarland & Co., Inc.) ISBN 0-7864-1872-9, p. 121. ^ "Toshiba's New Rechargeable Lithium-Ion Battery Recharges in Only One Minute" (Press release). Toshiba Corporation. 2005-03-29. Retrieved 2016-12-14. ^ "Neue Stromtankstelle: Elektroautos laden in 20 Minuten". golem.de (in German). 2011-09-15. ^ "Neue Batterien laden superschnell auf" [New batteries charge quickly]. Bluewin (in German). Switzerland. 2014-10-20. Archived from the original on 2014-10-20. Eine neue Art von Akku erreicht schon nach zwei Minuten am Strom eine 70-prozentige Ladung. Vor allem Elektroautos sollen profitieren. ^ "Ultra-fast charging batteries that can be 70% recharged in just two minutes". Science Daily. Retrieved 2014-12-30. ^ "Neuer Akku lädt in wenigen Minuten". golem.de. Retrieved 2014-12-30. ^ "Lithium-Titan lädt in Sekunden". elektroniknet. Retrieved 2014-12-30. ^ "Forscher: Aluminium-Speicher "hat alles, was man sich für eine Batterie erträumen kann"" [Researcher: Aluminum storage "has everything you can dream for a battery"]. ecomento.tv (in German). German. 2015-04-13. Retrieved 2017-02-11. ^ Lin, Meng-Chang; Gong, Ming; Lu, Bingan; Wu, Yingpeng; Wang, Di-Yan; Guan, Mingyun; Angell, Michael; Chen, Changxin; Yang, Jiang; Hwang, Bing-Joe; Dai, Hongjie (2015-04-06). "An ultrafast rechargeable aluminium-ion battery". Nature. 520 (7547): 324–328. doi:10.1038/nature14340. ^ "Elektroauto mit 1088 PS entwickelt" (in German). 2014-10-24. Retrieved 2015-04-12. ^ "Site homepage". Retrieved 2016-12-10 – via scitation.aip.org. ^ a b "Car Companies' Head-on Competition In Electric Vehicle Charging." (Website). The Auto Channel, 1998-11-24. Retrieved on 2007-08-21. ^ "EDF and Toyota Announce Technology Partnership in Europe for Rechargeable Hybrid Vehicles" [EDF et Toyota annoncent un partenariat technologique en Europe relatif aux véhicules hybrides rechargeables] (Press release). Électricité de France. 2007-09-05. Retrieved 2016-12-29. ^ "Elektromotive: The ultimate zero-emission transport system". Elektromotive, Ltd. 2007. Retrieved 2007-10-26. ^ Abuelsamid, Sam (2007-10-26). "UK to install 250 new public charging stations by next spring". Autoblog. Retrieved 2016-12-28. ^ Mitchell, T (2003). "AC Propulsion Debuts tzero with LiIon Battery" (PDF) (Press release). AC Propulsion. Archived from the original (PDF) on 2003-10-07. Retrieved 2006-07-05. ^ Gergely, Andras (2007-06-21). "Lithium batteries power hybrid cars of future: Saft". Reuters. US. Retrieved 2007-06-22. ^ Gunther, Marc (2009-04-13). "Warren Buffett takes charge". CNN. US. Retrieved 2017-02-11. ^ "Roadster / features and specs". Archived from the original on 2013-02-12. ^ "Electric cars wait in the wings". Manawatu Standard. 2008-09-17. Retrieved 2011-09-29. ^ "MyXPCar.com". myxpcar.com. Retrieved 2014-02-01. ^ "Volkswagen Says 'No' to Battery Swapping, 'Yes' to Electrics in U.S. : Greentech Media". greentechmedia.com. 2009-09-17. Retrieved 2014-02-01. ^ "What's Hot: Car News, Photos, Videos & Road Tests | Edmunds.com". blogs.edmunds.com. Archived from the original on 2012-07-07. Retrieved 2014-02-01. ^ a b "Battery swap model ?won?t work? | carsguide.com.au". carsguide.com.au. Retrieved 2014-03-03. ^ "Greenstop - a network of alternative fuel stops". greenstop.com. Retrieved 2014-02-01. ^ "Error - LexisNexis® Publisher". www6.lexisnexis.com. Retrieved 2014-02-01. ^ "Opinion: Nice try for the solar industry". automotivedesign-europe.com. Retrieved 2014-02-01. ^ Woody, Todd. "PG&E's Battery Power Plans Could Jump Start Electric Car Market". (Blog). Green Wombat, 2007-06-12. Retrieved on 2007-08-19. ^ Knipe, TJ; Gaillac, Loïc; Argueta, Juan (2003). "100,000-Mile Evaluation of the Toyota RAV4 EV" (PDF). evchargernews. Southern California Edison, Electric Vehicle Technical Center. Retrieved 2006-07-05. ^ "Specification for Winston rare earth lithium yttrium power battery". Winston Battery. Archived from the original on 2016-02-03. Retrieved 2016-10-28 – via 3xe-electric-cars.com. ^ "Sony's Energy Storage System" (PDF). Sony. Archived from the original (PDF) on 2014-06-06 – via Frankensolar. ^ "Tesla Roadster – Batterie langlebiger als erwartet" [Tesla Roadster - battery more durable than expected]. Green Motors Blog (in German). 2013-07-17. Archived from the original on 2014-04-07. Retrieved 2014-03-31. ^ "Plug In America Research Shows That Tesla Roadster Battery Performance Bests Tesla Motors' Own Projections". Plugin America. Archived from the original on 2016-02-03. Retrieved 2014-03-31. ^ "Batteriegarantie: 8 Jahre, unbegrenzte km" [Battery guarantee: 8 years, unlimited km] (in German). Tesla. Retrieved 2014-04-05. ^ "VARTA Storage garantiert 14.000 Zyklen bei Batteriespeichern" [VARTA Storage guarantees 14,000 cycles of battery backups]. 2015-07-13. Retrieved 2016-10-28. ^ "VARTA Storage erweitert Garantie für Batteriespeicher auf 14.000 Zyklen" [VARTA Storage extends warranty for battery storage to 14,000 cycles]. Archived from the original on 2015-07-13. Retrieved 2015-07-13. ^ Cobb, Jeff (2017-01-09). "Nissan's Quarter-Millionth Leaf Means It's The Best-Selling Plug-in Car In History". HybridCars.com. Retrieved 2017-02-04. As of December 2016[update], the Nissan Leaf is the world's best-selling plug-in car in history with more than 250,000 units delivered, followed by the Tesla Model S with over 158,000 sales, the Volt/Ampera family of vehicles with 134,500 vehicles sold, and the Mitsubishi Outlander PHEV with about 116,500 units sold through November 2016. These are the only plug-in electric cars so far with over 100,000 global sales. ^ Schwarzer, Christoph M. (2015-04-01). "Batterie-Upgrade? : Unwahrscheinlich!" [Battery Upgrade ? : Unlikely!]. Zeit Online (in German). Germany. Retrieved 2016-02-22. ^ Walford, Lynn (2014-07-18). "Are EV batteries safe? Electric car batteries can be safer than gas cars". auto connected car. Retrieved 2014-07-22. ^ "ECD Ovonics Amended General Statement of Beneficial Ownership". 2004-12-02. Archived from the original on 2009-07-29. Retrieved 2009-10-08. ^ "ECD Ovonics 10-Q Quarterly Report for the period ending March 31, 2008". 2008-03-31. Archived from the original on 2009-07-28. Retrieved 2009-10-08. ^ "Research & Development | Technologies & Strategies That Enable Research & Development". rdmag.com. Retrieved 2014-02-01. ^ "Berkeley Lab News Center Press Release: Berkeley Lab Wins Four Prestigious 2008 R&D 100 Awards for Technology Advances". 2008. Retrieved 2016-12-10. ^ Wald, Matthew L. (2008-01-13). "Closing the Power Gap Between a Hybrid's Supply and Demand". The New York Times. Retrieved 2010-05-01. ^ "Recovery Act Announcement: President Obama Announces $2.4 Billion in Grants to Accelerate the Manufacturing and Deployment of the Next Generation of U.S. Batteries and Electric Vehicles". EERE News. U.S Department of Energy. 2009-08-05. Archived from the original on 2009-08-26. ^ "Battery Separator - Battery Separators, Battery Membrane | Celgard". celgard.com. Retrieved 2014-02-01. ^ "Celgard | Press Releases | In The News". celgard.com. Retrieved 2014-02-01. ^ "EAST PENN manufacturing co., inc.: Lead-Acid Batteries; Battery Manufacturers; Thousands of Different Types of Batteries, Cable & Wire Product". eastpenn-deka.com. Retrieved 2014-02-01. Wikimedia Commons has media related to Traction batteries. This page was last edited on 15 April 2019, at 19:39 (UTC).